Over the last two years, Eesti Gaas (Estonia Gas) has completed 1,500 LNG bunkers for M.V. Megastar, a fast ro-ro/passenger ferry built by Meyer Turku in Finland for the Estonian shipping company Tallink. The ferry sails the two-hour route between Helsinki and Tallinn. In two years, Eesti Gaas has carried 28,300 tons of LNG from various sources of supply. In 2017, 12,300 tonnes of LNG was delivered. In 2018 that amount increased 30% to more than 16,000 tonnes. Already, indications are that 2019 LNG sales will be even higher, primarily because Eesti Gas has moved to become the sole supplier of LNG bunkers for the Megastar. Gas supplies are obtained from Russia, Finland, Poland and Lithuania. 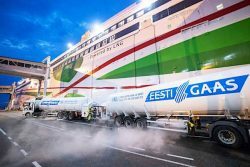 LNG is delivered to Tallink’s Megastar by eight special trailer trucks acquired for this purpose by Eesti Gaas. About 65 bunkering operations have been carried out in one month. The refuelling process takes up to 4 hours. Liquefied natural gas (LNG) is a pure, colorless and odorless liquid produced by cooling natural gas to about -160 degrees. During liquefaction, the volume of gas decreases and as a result the volume of LNG is about 600 times less than the volume of natural gas under normal conditions. This allows natural gas to supply objects and areas that are not connected to the gas pipeline. LNG is an environmentally friendly fuel that significantly reduces carbon dioxide and nitrous oxide emissions and does produces virtually no soot particles and carbon monoxide emissions.